Philadelphia archbishop Charles Chaput, right, has a moment with Pope Francis during a Mass at Cathedral Basilica of Sts. Peter and Paul, Saturday, Sept. 26, 2015, in Philadelphia. The American archbishop who welcomed Pope Francis to the final rally of his U.S. tour warned Friday that Francis' big family summit of bishops risks doing serious harm to the Catholic faith if it endorses changes to the church's practice on marriage. 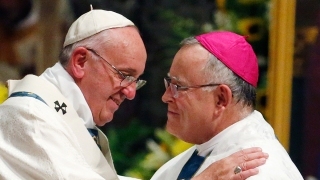 Archbishop Charles Chaput of Philadelphia took to The Wall Street Journal to convey the "anxiety" and "worry" felt by many bishops over proposals at Francis' three-week synod on the family to change the church's practices of ministering to divorced and civilly remarried couples. Chaput, who hosted Francis in Philadelphia earlier this month at a big family rally, warned that a change in pastoral practice could eventually lead to a change in what Catholics actually profess. "Practice inevitably shapes belief," he warned. Chaput's alarm underscored the core tension running through the closed-door meeting that has laid bare the split in the Catholic Church between conservatives who insist that restating church doctrine is the best answer to families in crisis, and progressives who want to treat family problems with a more accommodating, case-by-case pastoral practice. The tensions came to a head this week with revelations that 13 cardinals — headed by Australia's George Pell and including New York's archbishop, Cardinal Timothy Dolan — penned a letter to Francis expressing grave concerns about the way the synod was being run and warning that Rome could go the way of "collapsed" Protestant churches that abandoned core Christian beliefs in the name of pastoral "adaptation." The synod enters its homestretch this coming week, when the 270 bishops will vote on a final document that will be given to Francis. He has not said if he will publish it immediately or hold onto it for a possible future document of his own. The key question is how the synod "fathers" will treat divorced and civilly remarried Catholics. Church teaching holds that unless these Catholics got an annulment, they are committing adultery and cannot receive Communion. Progressives are seeking some wiggle room to balance doctrine with mercy and look at each couple on a case-by-case basis, accompanying them on a path of reconciliation that could lead to them eventually receiving the sacraments. American Archbishop Blase Cupich of Chicago, who was Francis' first major bishop appointment in the U.S. and was hand-picked by the pope to join the synod, signaled he favored this approach. "If people come to a decision in good conscience, our job with the church is to help them move forward and respect that," Cupich said. "The conscience is inviolable." While he acknowledged the synod may not come up with a clear-cut answer to the question, Cupich said he didn't share Chaput's anxiety. And he said he didn't think Francis did, either. "He just looks so refreshed, calm, at peace," he said. "If the Holy Father is at peace with the way things are going, I think that each one of us should put aside the fears or anxieties that might be present in our hearts and pay attention to (the pope) at this moment."